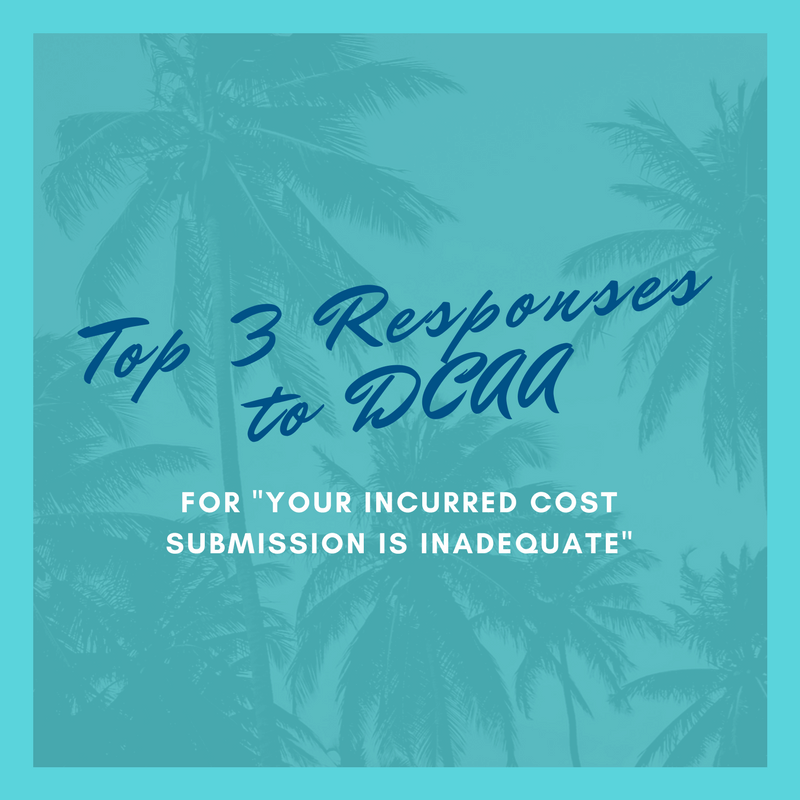 If you are a small business in federal contracting, you probably are getting letters from DCAA about the Incurred Cost Submission you sent in on June 30 – and wondering how to respond. At last, DCAA actually reviews the ICE submissions for adequacy before the person who prepared it has moved on to another job. In the past, it was rare for them to even acknowledge receipt in the fiscal year. Getting a two-page letter with the DCAA emblem at the top is disconcerting – but FEAR NOT — most of the problems are just format or missing information and easily fixed — if you can understand the geeky accounting terminology of government contracting. Deficiency: Unallowable expense accounts/amounts are not identified as a reduction or adjustment to booked indirect expenses shown in the GL. Response: What this means is that on Schedule B for G&A, you didn’t add all of your unallowable accounts into the G&A pool in the first column, and then complete the “adjustment” column to back it all out in the third column. Deficiency: Contract Ceilings are not listed on Schedule I. Response: What is odd is there isn’t a column called Contract Ceiling on this Schedule, otherwise we would have filled it out. If you completed the Contract Briefs in Supplement O, there would be a ceiling, but most companies wait until audit to submit those because the information will change by the time of audit. Schedule O shows Ceilings, but Schedule O is only used when you are reporting contracts that are ready to close out. A safe response would be to add columns on Schedule I with contract values. Deficiency: For Schedule I, identify whether the listed contract is subject to the penalty clause. Response: First you have to take your best guess about whether the contract is subject to the penalty clause – which appears to be all DoD prime contracts over the FAR threshold ($700K?) even if the clause is missing from the contract. The penalty clause relates to the Allowable Cost and Payment Clause FAR 52.216-7 which applies to Cost Plus for sure and probably many other contract types. This post is just to let you know you are not alone in your confusion. There are many other issues related to what data to list for T&M contracts, and how to list G&A on T&M direct travel when you have ceiling rates. It’s all about how much detail to include on the initial submission and trying to guess what DCAA wants to see on the report. Whenever a small business wins their first Cost Plus prime contract, it’s a great accomplishment, but the hidden cost is in the burden of accounting systems and the ICE reporting, plus trying to find accounting professionals that understand the rules of government contracting. Please share your thoughts and comments so we can save these answers for next year!